Syrian War Report – November 16, 2017: Fierce Fighting Erupts In Eastern Ghouta 4.6923076923077 out of 5 based on 13 ratings. 13 user reviews. Main playlist with ID 1083 does not exist! Damn it, to many people get killed. Just for greed and power. And so the time has come to liberate the western parts of Syria from terrorist. WTF is with East Ghouta anyway? Who keeps supplying the head-choppers there and how many places can they possibly hide? I swear, the SAA should just line up a hundred or so bulldozers in tandem, move forward all at once from west to east and level every last bit of the place. There shouldn’t be any international objections – Israel does it all the time and the US cheers them on. 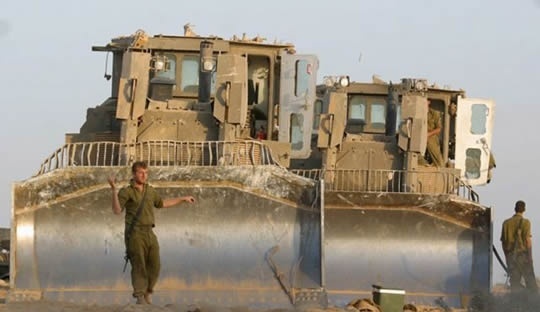 Our “Proudly Made in America” Cat D9s have been used for decades by the Israelis for ripping up 500-year-old terrorist olive orchards, crushing terrorist generations-old family homes and farms, and even flattening an elderly couple (suspect terrorists) or two and the occasional terrorist-supporting teen-age girl from the US. See? Perfectly legal. All we need to do is find a couple hundred rabid homicidal psychopaths willing to drive the ‘dozers. Hmmm… come to think of it, that’s precisely the kind of human waste the SAA is trying to get rid of in East Ghouita. Damn! I guess they’ll just have to stick with another Sarin barrel bomb attack. Aim for the babies! Get a couple busloads of White Helmet with cameras in there and alert YouTube for a priority upload. Bllx Dump the father of all bombs on them. Only if you believe the Deep State cover story that US objective in Syria is to attack ISIS. Since the true objective is advancing the agenda of Axis of Evil of Wahhabistan, Ziostan, GCC, and NATO (Nazi Alliance of Terrorist Organizations). We will soon see. I think this war’s current phase is ending. Part 2 will begin soon. WTF did you expect? ; Syria, Russia, Hezbollah plus……. all of these vermin are controlled by the US, you can trust them nor make honour bound agreements with them and hoe they keep it, unless of course you sell your Souls. Now, eliminate them, before they eliminate you. “PROTOCOLS” is an anti Semitic forgery. Jewish/Zionist oligarchs rule with other oligarchs, and yes lead them by their noses. Jews neither invented banks nor invented capitalism. They are the best players of the game, and nothing more. The Israelis and Zionists are the musclemen of Wall Street and London. Once finance capital is state owned, like in China, you take the wind away from finance capital. A real civil war In israHELL against zionists , not a staged proxy foreigners-terrorists’s from overseas abroad civil war as seen here in this article infographic video , a real civil war against zionists in israHELL to liberate arab Palestine from occupation is immenent underway ! If it’s a toss-up between more terror attacks in Damascus. or more terror attacks in East Gouta, guess who is going to get more attacks? There is a new ME strategy being launched by NATO minis Turkey, the war is being transferred back to Libya, which means that Netanyahu has got some inducement to sit in the margins for a while longer yet, anti-Iran is only a cover. So Sisi is now a key player in the real Western agenda, it’s humiliation for Putin because he’s been backing Haftar, now he’ll be squeezed, I don’t think the BH will know what to do if Putin tries to hold on to his duplicity. The line up without the foreigners is Egypt Saudi Arabia and the Emirates, against Yemen Lebanon Syria Turkey Iraq and Iran, the BH has to be supported along with the GNA even if it means dumping Sisi, put it this way if Sisi doesn’t go then kiss goodbye to any kind of peace till something really big happens.